This 41-year-old animal lover saddled up and founded People and Animals Learning Services because of her love for helping those with disabilities. 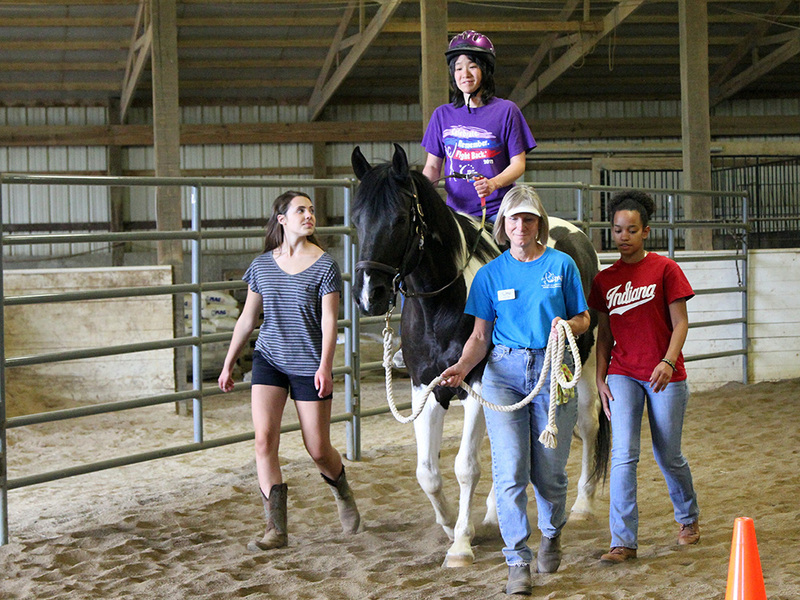 Horseback riding instructors help guide a participant during her riding lesson at the People and Animal Learning Services, Inc. facility in Bloomington. Growing up in Bloomington with a mother who provided horseback-riding lessons for those with physical limitations, Goodman was inspired to open her own facility when she moved back in 2000. She got her bachelor’s degree in psychology with a specialization in human and animal Interactions and earned her certification in therapeutic horsemanship. She shares with 812 how a special connection with humans makes horses such great animals for therapy. Horses help riders build strength. The movement and warmth of the horse can strengthen your muscles. If you have a person who is really spastic in their muscles, and you put them on a horse that’s really smooth, that’s going to relax their muscles. If you have a person who has trouble using their muscles and put them on a bouncier horse, then that can increase tone in the muscles. their muscle tone. Just the movement of the horse can have a huge impact physically. They help us with our self-esteem. They’re amazing animals and really big, so one of the benefits is getting them to do what you want them to do. The pride of being in charge of such a large animal, whether on the ground, riding or whatever, will help with self-esteem. They teach us about acceptance. There are horses with all different personalities, but horses in general are very non-judgmental beings. Whereas people with disabilities go through many parts of their lives being judged because they look, talk or walk different. Horses see everyone as equal as long as you treat them properly. They create a calming effect even in tough times. We hear time and time again from our clients that therapy can be difficult. The magical thing about horses is that our clients are getting therapeutic benefits in a really super-fun environment. They almost don’t know that they’re working for it. They help us heal emotionally and physically. We started the Veterans Program because a lot of Veterans have post-traumatic stress disorder or physical limitations. Riding a horse with its calming nature and learning how to trust another being can be very beneficial. We’ve done family integration where the dad has been gone for a long period of time, and the little kids don’t know him well. When their dad is back, they have an activity that they can do together. It gives them something to bond over, and something to talk about and share.